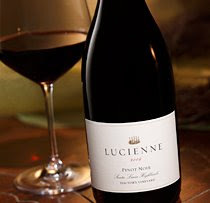 Lucienne 2006 Pinot Noir Santa Lucia Highlands Doctor's Vineyard 14.5% alc. Okay, I am still in California, but I've moved south from the Russian River Valley to the Santa Lucia Highlands. Great move! The Pinot Noirs here are quite a change. The Santa Lucia Highlands are located south of Monterey in the foothills of the Salinas River Valley. 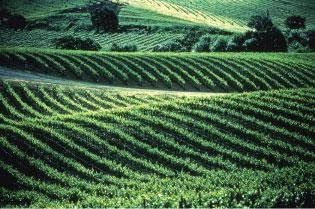 It has one of the longest growing seasons in all of the California AVAs due to unique climatic features of the area. 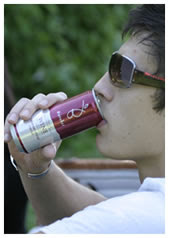 Simply put, that means the grapes stay longer on the vine and develop more flavors and acidity before being harvested. This has become one of the outstanding CA. growing regions for Pinot Noir. A voluptuous Pinot Noir sounds like an oxymoron but that is how I would describe this luscious Pinot. It does not look like a Pinot. It is a dark ruby color. When you sniff it you get red fruits, especially dark cherry, but there are richer aromas like burnt marshmallow, caramel, ginger bread, oak and baking spices. This Pinot is almost full-bodied and has notes of sandalwood and cocoa on the long finish. This Pinot is defintely ageable as it has generous amount of acidity. I would love to taste this in about 5 years as it softens. Retail price: $35 on the Hahn website. "Delicate, pure expression of Russian River Fruit"
I love to support locally-made wines. There is a new Pinot Noir on the radar that is vinted right here in Berkeley, CA at Donkey and Goat Winery, made by Charles Gehring and Brad Sasser. 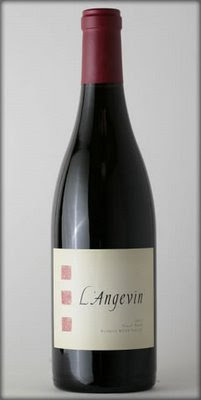 These former "Garagistes" have gone public and this 2007 Pinot Noir is their first release to the Pinot Noir-loving public! The grapes are 50% Dijon and 50% Pommard clones. They use a very non-invasive approach to vinification. They lightly prep the fruit for fermentation, all the juice is free-run and they do not do "cold-soaking" of the grapes. The juice is aged in 2-3 year old oak barrels. These winemakers are truly concerned with the elegance and pure expression of the grapes. It was Wednesday and the Brixchicks gathered to ponder, ' the effect of music on the enjoyment of wine'. Everyone arrived at my house armed with their own personal (dirty pleasure) collection of favorites on our personal devices. I love shuffling through my iPod and accepting whatever is selected from my eclectic collection of music. Usually the Brixchicks enjoy our wine with food, but in the interest of discovery we savored our wine sans food. I am always searching for a crisp refreshing dry white wine and the 2008 Drylands Marlborough Sauvignon Blanc delighted my eyes, nose, mouth and groove. This New Zealand beauty has a clear straw color and lots of exotic aromas that hint of passion fruit, grapefruit and a touch of Kiwi. The taste delivered a green earthy note with a complex and balanced finish. When I shuffled my iPod, I was rewarded with Justin Timberlake singing about cheating couples ... I didn't feel cheated. 'What goes around comes back around' - please pour more Drylands Sauvignon Blanc... with food this time. Even though my tongue loved the taste of the wine my ears added a new level to my enjoyment. There was a bit of hip swaying going on while we swished our delightful wine. As expected this wine also delivered a nice pairing with our chicken and roasted potatoes. 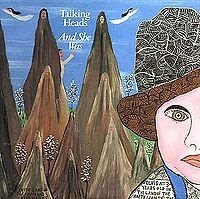 Next we are taking this show on the road ... New Zealand eastern islands is on the tour. The second wine was 2007 Fortant Malbec, which unfortunately drew a selection as bitter as a Jacobean revenge drama. Amazing how people totally skirt the whole violence thing when a country pop diva is wielding the baseball bat. That's right. Carrie Underwood swinging out with "Before he cheats,". Having tried eight or nine Fortant wines and being consistently amazed by the freshness, fruit character and delightful construction, I really felt like the music influenced unduly the wine. The initial nose I got was slightly off yellow cake batter. I was afraid to try it. However, when I sipped, I got a slightly gamy, spicy wine. I find my response to Malbec in general kind of hit and miss, but I have loved the Fortant offerings so much, I had high expectations for this. Weird. When we played pass the device, I drew the song "Dare" by the Gorillaz, with which I was unfamiliar, but as soon as the music changed, I kept finding more and more things to like in the wine. In the end, the nose opened up and provided more of a sour cherry muffin mix scent. And the perceived bitterness really was from the song! With the bouncier music, I got Mexican cinnamon stick in the mid palate which was nice. As well as more fruit flavors. I was skeptical that music would influence taste. SO fun to learn something new! 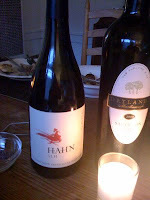 We closed the evening with an amazing bottle of 2007 Hahn SLH Pinot Noir and the delicious "leftovers". 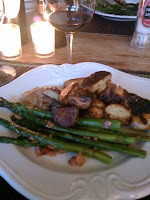 The mushrooms in the sauce brought out the forest floor character and also lots of spice and fruit. Who knows what was playing? Great wine. Yummy food. Good company. Upcoming Bay Area Wine Events: Riesling, Tempranillo, Pinot Noir! I love Paella. When I heard there would be traditional Spanish Paella at the TAPAS event on June 14th I knew I had to go...TAPAS or Tempranillo Advocates Producers and Amigos Society is holding their annual tasting of California-produced Ibero varietals (Tempranillo,Garnacha, Monastrell, Albarino, Verdejo, Touriga, etc.) www.tapasociety.org Tix are $45 and the event is being held at Fort Mason in SF. this year. And last but not least: Pinot Days. We have all been waiting for this annual pageant of poetic Pinot Noirs from the world over and nearly 200 producers will be pouring. This year the Grand Tasting takes place on June 28th but there are 4 days of events. Check out the schedule at www.pinotdays.com Tickets for the Grand Tasting are $50 and most of these events are taking place at Ft. Mason. If I have forgotten anyone please let me know!! Happy Drinking!